Combine Pretzels, Sugar, and Butter and press into a 9 inch pie pan. Bake for 6-8 minutes and cool. After cooled pour in Ganache and let set in cooler until firm. Combine the milk and cream with 2oz of sugar and bring to a boil. Meanwhile blend the egg yolks and remaining 2oz of sugar together. Add the eggs to the hot milk slowly to temper the eggs and cook until thick enough to set up like pudding and then add extract. Add the 6oz of Peanut Butter to it. Pour this mixture onto the set up Ganache and pretzel crust. 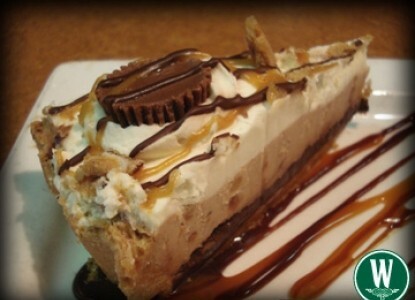 Let pie set 6-8 hoursand top with crumbled peanut butter cups.